Ananya Dance Theatre returns to KST—after captivating audiences with its expansive approach to contemporary Indian dance last fall—to present its newest work Shaatranga, which translates as “seven colors.” Indigo and blue jeans take on resonant meaning as choreographer Ananya Chatterjea uses two primary metaphors to explore relationships among global south communities linked by Indian Ocean trade routes that pre-existed colonization. Shaatranga explores the question “How do we show up for each other?” and shares multifaceted stories that express not only pain, but joys, laughter, and the labor that creates positive force in the world. 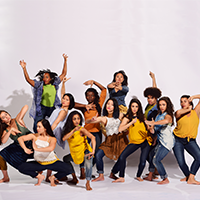 A centerpiece in this year’s 12th annual newMoves Contemporary Dance Festival a platform for local and National contemporary dance makers that fosters new works and new connections. Full festival program to be announced. Visit www.kelly-strayhorn.org. The presentation of Shaatranga is made possible in part by the National Endowments for the Arts, the ArtsCONNECT program of Mid Atlantic Arts Foundation with support from the National Endowment for the Arts’ Regional Touring Program; and by the National Performance Network (NPN) Artist Engagement Fund. For more information, visit npnweb.org.